Our Pure Copper Cuff Bracelets are of the highest quality, beautifully formed and polished. The natural properties of Pure Copper may help provide relief pain to joints and muscles by drawing toxins from your body. The addition of powerful Neodymium magnets (2 per bracelet) may help enhance blood flow so Copper absorption into the body is accelerated. To select your size measure around the wrist allowing for a small gap between the terminals. Once fitted your Copper Bracelet can stay in place. A greenish colour may appear on the skin. This is normal and will wash away. 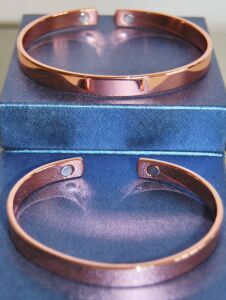 We have recently sourced a new line of solid Pure Copper Cuff Bracelets of the highest quality, beautifully formed and polished. The natural properties of Copper are reputed to help provide pain relief to joints and muscles by drawing toxins from your body. The addition of powerful neodymium magnets (two per bracelet) may help enhance bloodflow so Copper absorption into the blood is accelerated. When selecting your size, measure your wrist then allow for a small gap between the bracelet terminals. Gently squeeze the cuff together until it feels comfortable, leaving that small gap. 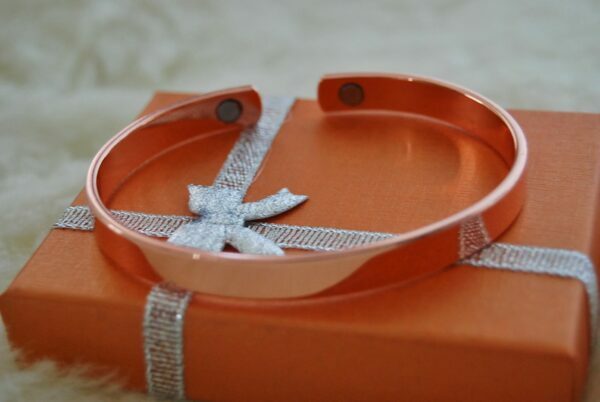 Your Copper Cuff B racelet can now stay in place.